You might have heard or read about scary offload stories of tourists who wish to travel outside the country being of loaded or couldn't get pass through the immigration officer . I heard and read them too. Some people end up not grabbing that opportunity of traveling outside the country because of such stories. You are not financially equipped for the travel and the sponsoring party is something unverifiable and suspicious. You are travelling with a suspecious person or someone you don't know or not related to. You have the tendency to apply for employment in that country through illegal means or without proper documentation. However, if you are in good faith and travelling for leisure and financially equipped for the said travel then you should not be worried about it. 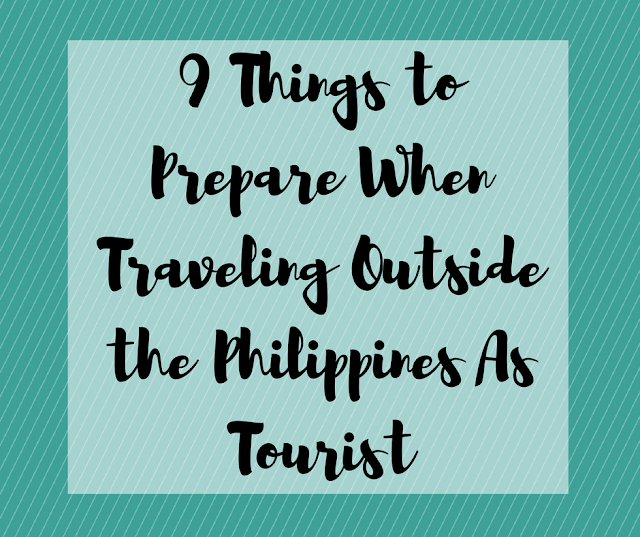 So here are the things that you should do when travelling out of the country. 1. Dress professionally and decent. I know you see other people dress inappropriately in the airport, but most specially if it's your first time to travel outside of the country please be in business casual. If you are traveling with the group, if you have a company or group uniform, the whole group should wear it, for the immigration officers to recognize you and your group. You'll get pass the immigration table faster too. 2. Make sure your passport is valid. Meaning it will not expire in less than 6 months of your travel date. If ever the expire date is 6 months or less, please make sure to renew it before your travel date and bring it with you during your trip. Yes bring it with you with your new passport, most specially if you have already traveled outside the country prior to that specific trip. Some immigration officers will require it. 3. Print out all your plane tickets. Most specially your return tickets. If you are travelling in a group, print out tickets for each member of the group. You will be facing the immigration officer one by one and not by group. 4. Print out accommodation/hotel booking confirmation. Same with return tickets, print out hotel booking confirmation. If travelling in a group and you have group accommodation, print out one for each member of the group. If you don't have hotel bookings and you will be staying in a friend or a family member, make sure to print out an invitation letter with their signatures. The invitation letter should include the dates you will be staying with them, your complete names and the complete names of the person you will be staying with, their complete address and contact numbers. 5. Print out Tour Package Confirmation or Tour Itinerary. If you booked for a tour package, print out a tour package confirmation. If in a group, print out the same for each member of the group. If you are not booked in a tour package, create your own itinerary for the days you are traveling or staying in that country. It doesn't have to be followed but some immigration officers would like to take a peek on your itinerary. 6. Bring Government issued ID's other than your passport or Company/School IDs. Most of the time, they would check your other id's. If you are working, they'd like to check your company ID's this is also to make sure that you can afford the travel and you will return because you still have work. If you are a government employee however, you need to secure a travel order from your office before leaving. Without it you will not be granted for exit to the Philippines. Unless you will not declare it, yah know. 7. Bring enough cash in currency of the country of destination. Money Exchange is available in the airport if you haven't exchanged yet prior to your travel date. It is expensive in few centavos of course than outside the airport. Exchange enough cash for the travel, don't bring suspeciously too much cash. If you have credit cards or ATM cards with you, you can just withdraw at your country of destination in case you run short of cash. 8. Look at the immigration straight in the eye when you are at the window. To show confidence and courtesy, Greet the immigration with a smile, hand over your passport and boarding pass and look at him/her straight in the eye. Don't move too much or do something else. You might find it funny but if your too busy with something during the interview that might cause you to miss you trip. Answer all the questions politely in moderate voice and present the documents as needed. If the immigration officer did not ask for it, don't present it. Don't be too proactive to present such documents. Once granted with a stamp, get your documents, smile, thank the officer and leave the counter immediately. Wait for your colleagues or group at the hall way towards the boarding gates right after the final screening/baggage inspection. 9. Head to your boarding gates at least an hour or 2 hours before your scheduled boarding time. Your boarding gates might be too far from what you imagined and might be a train/bus ride away. If you find this helpful, please share it to your friends. Thank you!